Arrested Former Mozambican Finance Minister to Continue Fight Against Extradition to U.S.
How Close are Govt and IMF on the Audit? Maputo — The arrest of a former finance minister as well as the indictment of several other government officials has bust wide open the level of government corruption in Mozambique and to an extent, raised some concern in Angola where some firms indicted in Mozambique are present. In Mozambique, the turn of events offer a stern test to the ruling party's prospects in general elections later this year. The arrest of former minister, Manuel Chang and alleged accomplices maintains the Southern African country's poor international reputation, on the back of a tainted status as a hub for money laundering and rising graft. A minister from 2005 to 2015, Chang is detained in South Africa on charges bordering on fraud and money laundering for his alleged involvement in a US$2 billion scandal during Mozambique's debt crisis. There were revelations in 2016 of a hidden debt of over $1 billion, prompting the International Monetary Fund (IMF) and foreign donors to cut off aid. About $200 million was allegedly spent on bribes and kickbacks in loans to state-owned companies in Mozambique. According to the United States indictment, loans were secured from Credit Suisse, the Swiss multinational investment bank and financial services company, and Russia's VTB Bank. In a related development, Middle East-based Privinvest Group signed contracts to supply ships to Mozambique but never delivered. Alongside Chang's arrest in South Africa at the end of 2018, three former employees of Credit Suissewere arrested in the Dominican Republic and extradited to the US, which also seeks Chang's extradition. The ex-employees of Credit Suisse are Andrew Pearse, Surjan Singh and Detelina Subeva. Another suspect, Jean Boustani, has been arrested in the US. He is a Lebanese citizen who worked for an Abu Dhabi-based contractor of the Mozambican companies. French-Lebanese billionaire, Iskander Safa is founder of the contractor and was fingered in a 2013 order for fishing boats believed to have been used to hide a secret arms deal for Mozambique. The presence of the-then France President, Francois Hollande, and Mozambique counterpart, Armando Guebuzza, indicated an interest for France to get security access of the Mozambique waters. At least 18 other unnamed officials from Mozambique have been implicated in the debt scandal. Chang is arguably the most high-profile official to come under probe for corruption since independence from Portugal in 1975. 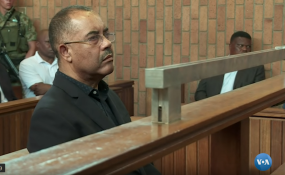 "The prospect of Chang appearing in a US court to spill the beans on the other Mozambican government officials who apparently received even bigger bribes is clearly terrifying the ruling Mozambique Liberation Front (FRELIMO)," stated Peter Fabricius, Institute for Security Studies Consultant. Local socio-economic commentator, AlmiroMarcelino, is also of a similar opinion. "This is set to open a can of worms in the corruption that runs through the politics of this country," he said. "It has always been reported Mozambique is laden with corruption but this has mostly been on paper. The implication of Chang and others unnamed is testament to the depth of graft in our society," Mercellino added. Mozambique has become notably more corrupt in recent years, according to the Corruptions Perception Index published by the leading NGO fighting against corruption, Transparency International (TI). Centre for Public Integrity (CIP), TI's Mozambique chapter, which released the index, reported that Mozambique's score fell from 31 in 2015, to 27 in 2016, to 25 in the 2017. TI gives each country in its index a score ranging from zero (totally corrupt) to 100 (absolutely clean). In terms of ranking, Mozambique is in 153rd position out of 180 countries. TI says corruption is a major underlying cause of the country's malaise, and has been recently estimated to have cost the country nearly US$5 billion between 2002 and 2014. "Blighted by endemic corruption, Mozambique presents a textbook case of a country whose legal and institutional framework has been brought into line with international good practice, but whose good governance window dressing is unable to compensate for blatant abuses of power," index authors, Elisa Klein and Ariane Wolf, stated. The Business Anti-Corruption Portal said forms of corruption range from petty bribes to deeply entrenched patronage systems, and donor countries have shown dissatisfaction over the country's anti-corruption efforts. Political analyst, ElinaChavango, said the government of President Felipe Nyusi's silence on the arrest of Chang was conspicuous. That was before Mozambique also requested the extradition of Chang with his next court appearance set for February 5. This past weekend, Nyusi, and South African counterpart, Cyril Ramaphosa, met at the Mozambican parliament but respective delegations did not provide information to media regarding the meeting, which lasted hours. The meeting was to discuss the arrest of South African, Andre Hanekom, for alleged involvement in terror by Islamist groups in the northern Cabo Delgado in Mozambique. Angola president, Joao Lourenco, was present, with his country heading the Southern African Development Community (SADC) troika of Defence and Security Cooperation. "The silence (on Chang's arrest) is striking. One is left wondering if silence means consent that indeed the allegations are true or perhaps it's an admission of complicity on the part of the president," said Chavango. Chang is still a legislator for the ruling Front of the Liberation of Mozambique (FRELIMO). Nyusi was defence minister when the loans were agreed and he signed important contracts over the deals. However, former president, JoaquimChissano, and former finance minister, Tomaz Salomao, have called for justice to prevail. The scandal comes at an inopportune for the ruling party with general elections set October. "The unraveling crisis around the Credit Suisse controversy puts the ruling party in bad stead ahead of polls, also with the opposition Mozambique National Resistance (RENAMO) enjoying a new lease of life," Mercellion said. RENAMO recently elected OssufoMomade as the party president and presidential flag-bearer in the election. He replaces Afonso Dhlakama, who last May after a heart attack. The bribery scandal in Mozambique has seen the spotlight also shift to Angola, another ex-Portuguese colony. In 2016, Privinvest, announced the start of a major shipbuilding and maritime economy programme with Angola. The programme would initially see Privinvest provide a range of vessels for the Angolan Navy. Privinvest is to jointly develop and operate a shipyard in Angola. Privinvest also signed a memorandum of understanding with government to develop hydrokinetic energy in the country, to provide access to electricity to 14 million Angolans by 2025. No progress has been made or any news provided since the announcement. Analyst warned the fact that Angola signed deals with Privinest when current president, Lourenco, was defence minister, might therefore also concern investors, especially since the government never confirmed the investment. Furthermore, in May last year, Credit Suisse announced a $700 million loan to Angola. "If Lourenco is serious about eradicating corruption, he should be careful with who he deals with and how this may look to the outside," analyst Miguel Sanz said.